Do you need to keep some of your files unreadable to others? Do you want to be sure that when you leave your workplace your files are secure? 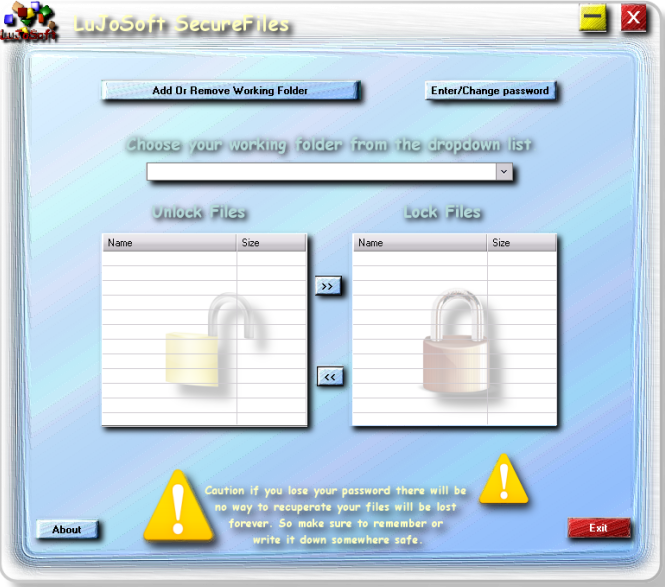 SecureFiles is a tool that enables you to encrypt your private files so that no one else can read them. Secure key creation from given password. Using Isolated Storage for storing per-user configuration. Extracting icons associated with files, using Win32 shell. Rijndael is the block cipher algorithm recently chosen by the National Institute of Science and Technology (NIST) as the Advanced Encryption Standard (AES). It supersedes the Data Encryption Standard (DES). NIST selected Rijndael as the standard symmetric key encryption algorithm to be used to encrypt sensitive (unclassified) American federal information. The choice was based on a careful and comprehensive analysis of the security and efficiency characteristics of Rijndael's algorithm. Rijndael is an iterated block cipher. Therefore, the encryption or decryption of a block of data is accomplished by the iteration (a round) of a specific transformation (a round function). Rijndael also defines a method to generate a series of subkeys from the original key. The generated sub keys are used as input with the round function. Define folders you want to protect. Select active folder to work with. Encrypt files selected in left listbox by clicking "move right" button. Decrypt files by clicking "move left" encrypted files in right listbox.